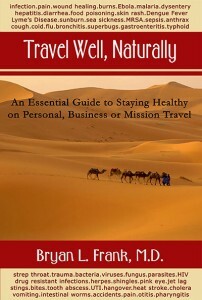 Buy the Book: Travel Well, Naturally: An Essential Guide to Staying Healthy on Personal, Business or Mission Travel by Bryan L. Frank, M.D. by Bryan L. Frank, M.D. NEW! Travel Well, Naturally: An Essential Guide to Staying Healthy on Personal, Business or Mission Travel guides the domestic or international traveler to stay healthy or get well naturally. Author Dr. Bryan L. Frank has traveled to over 60 countries, with over 100 missions and teaching tours on 6 continents for over 30 years. His teams are effectively tackling malaria, food poisoning, dysentery, cholera, hepatitis and also common ailments such as coughs, colds, flu and various pains. 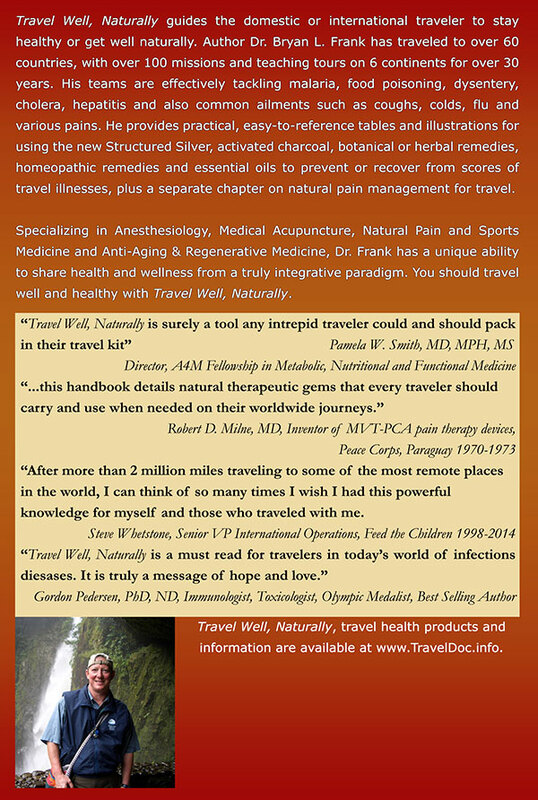 He provides practical, easy-to-reference tables and illustrations for using structured silver, activated charcoal, botanical or herbal remedies, homeopathic remedies and essential oils to prevent or recover from scores of travel illnesses, plus a separate chapter on natural pain management for travel.